You asked for it! 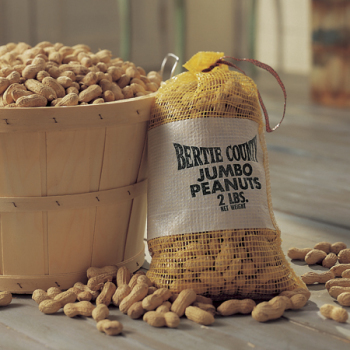 A bag or basket full of our huge, bright hull peanuts that are just right for those of you who want to create delicious treats in your own kitchens. 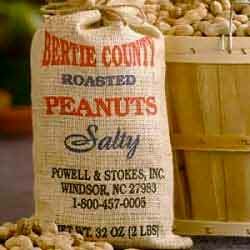 We suggest you try parching (or roasting) these huge peanuts. But, be careful. The aroma of roasting peanuts has been known to draw large crowds (not to mention the large, trunked, gray pachyderms these beauties attract!). ATTENTION: Raw In-Shell peanuts are shipped without any liquid cleaning of the shells. Therefore, the shells of those peanuts will often be off color (dark brown; black; multi-colored, etc.). Those colors are representative of the soil and weather conditions in which the peanut was grown. The peanut kernal inside the shell is perfectly ok to eat and is not affected by the color of the exterior shell. PLEASE NOTE: These are not green peanuts. These peanuts are dry. To boil them, please soak them in water for 24 hours. After that you may cook them using your favorite recipe. They're delicious! Owner Response:Thanks for finding us! Jun 30, 2014 | By Brett S.
Owner Response:No, we do not sell green peanuts. And, we'll be in touch regarding how to boil dry peanuts. Owner Response:We'll be in touch! 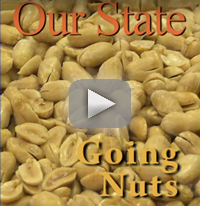 Owner Response:Sorry about that - the correct in shell peanuts are on the way! Owner Response:You will. Supposed to deliver tomorrow according to FedEx. Owner Response:Sorry to hear that you didn't like the product. 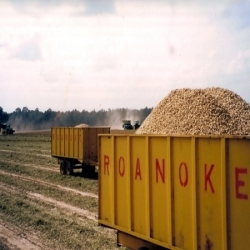 Dry, raw peanuts are what you have to use during the spring as the new, green peanuts have not even been planted yet. To use them for boiling all you need to do is soak the dry nuts for 24 hours - then boil away! We'll be in touch. Aug 16, 2016 | By Mike D.
Sep 21, 2017 | By Joe Felber Sr. Owner Response:Sorry to hear that the peanuts did not meet your expectations. We'll be in touch.